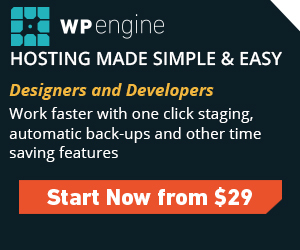 One plugin of mine that seems to be popular is eBay Feeds for WordPress. It’s a plugin that will allow you quickly and easily to embed eBay listings on your site. It works well and I’ve had a lot of great feedback, but it can be a bit tricky to set up. 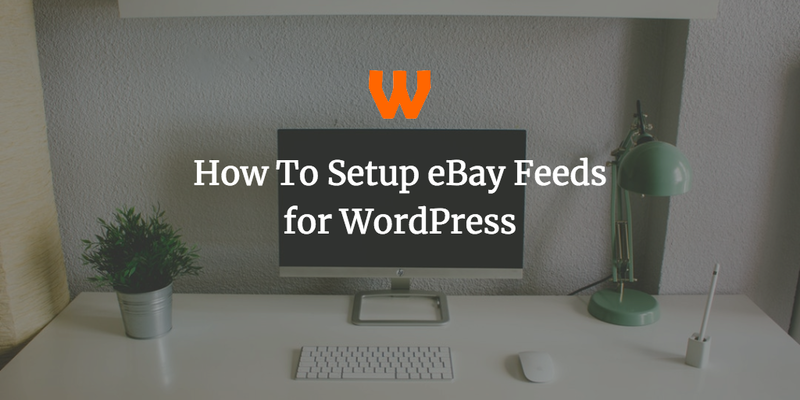 In this post I’ll show you how to set up eBay Feeds for WordPress for your site, allowing you to maybe earn a bit of cash on the site, or direct people to your listings. First off, the first thing you should know is that eBay Feeds haven’t worked right for years, but thankfully eBay’s Partner Network feeds have. eBay Partner Network is eBay’s affiliate programme allowing you to easily create links, banners or even API integrations using eBay’s network. Any sales that are made you will make a commission and whilst you’re not going to sell high ticket items or make a huge percentage commission, it is a trusted brand. It can be small or it can be in the hundreds, even thousands of pounds. Running it on one of my sites – Retro Garden – has seen me net a few thousand quid in passive income over the time that site has been live. And it’s free. 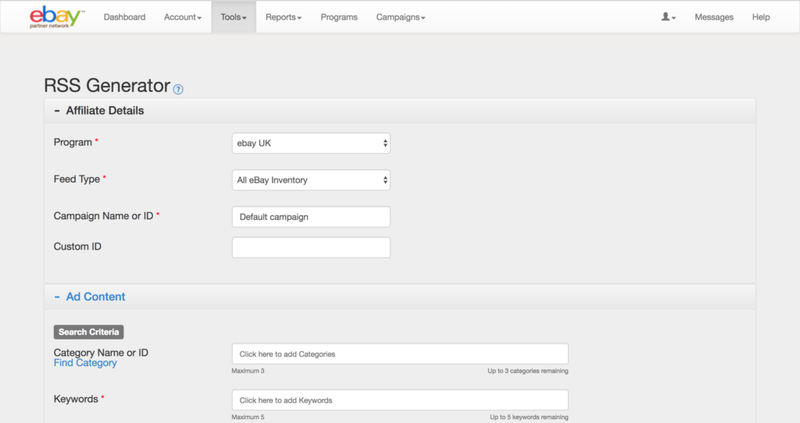 We’re going to use eBay Partner Network feeds for generating our feeds for our plugin. Go to https://epn.ebay.com/ to sign up. You can use your eBay ID to join. Fill in the details and you’re taken to the Dashboard. Head to Tools, and then head to RSS feed. You’re presenting with a set of dropdowns. Here’s what to put for each drop down. Program: Used to select the program you need to use. Usually you should set it to the country that you receive the most visitors for. Feed Type: All eBay Inventory. Deals doesn’t work quite yet. Campaign Name or ID: If you want to set up multiple campaigns for feeds, you can do so here. Alternatively “Default Campaign” is fine. Category Name or ID: If you want to limit your search to particular categories, do so here. This is type forward so it can work out the categories you wish to use. Keywords: You need to have a set of keywords to search for. You can make these as broad or as narrow as possible. Narrow does work better for sites that receive a lot of traffic, for what it’s worth. Search Title & Description: I always tick yes for this. Allows me to search for more items. Search Exclusions, Keywords and Categories allow you to exclude certain keywords and categories from appearing. Useful if your items appear in multiple categories, or has a similar name product in a different category (so if you focus on Sony Cameras you want to exclude Sony Mobile phones, for example). This is where people are having real power in generating powerful feeds for their business. Here’s some suggestions. Sort By: By default it’s “Best Match”, but you can arrange by items ending first or newest, as well as price. Useful for generating ‘ending soon’ lists, encouraging conversions as people don’t want to miss a deal. Seller ID(s): I’ve seen people, charities in particular, list their items using eBay Feeds for WordPress on their WordPress site. This is a useful way to make a bit extra cash from the items you sell on eBay. The ID is your ID name, rather than your number. The other fields, such as locations, and price, can work. You could use this to generate feeds on the fly, though you will have to contact me directly about this, as I am afraid this would be paid work! Once done, click the “Generate RSS” Link. You then get a preview of your feed (to make sure you are actually generating items with your search), as well as a Feed URL. Be sure to copy this to the safe space. There are two ways of adding a feed to your site, dependant on the route you wish to take. First off, if this is your first or only feed on your site, it’s a good practice to add this feed as the default feed. For ease of display, I use an example feed should you not populate it, so it’s a good idea to begin with. Within WordPress’ Dashboard, go to Settings > eBay Feeds for WordPress. The first option on this page is Default eBay Feed. Go to the safe space you stored your generated feed from the previous step, and paste that URL into the box next to it. Click “Save” to save. Whenever you don’t specify a feed within a shortcode or widget, the shortcode or widget will default to this feed. It’s a good practice to do that for your first feed as incase your forget. You will display your own feed (as per your style) rather than my feed, which may not fit your site. To get eBay Feeds for WordPress working via a shortcode, on any post or page, click on the dedicated eBay button located in the classic editor’s toolbar. From here, a window will appear. Add your URL in this window, along with the number of items to display. 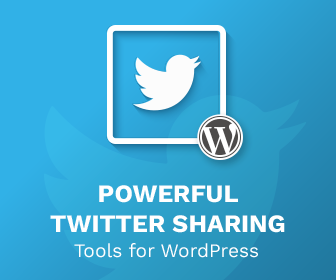 You can also add directly via shortcode using a similar shortcode to the one below (replacing https://feedurl.com/ with your feed URL, and 5 with the number of items to show. To add a feed via a widget, go to Appearance > Widgets within the WordPress Dashboard, and drag and drop the eBay Feeds for WordPress widget to wherever you wish it to display. Similarly to the shortcode, you can add a feed URL as well as a number of items to display here. However you can also add here an introduction text and title, to fit within your site display should you wish to do so. That’s basically how you set up your site. There’s plenty of other options in the plugin, should you wish to use SSL images, or display fallback text, these are covered within the plugin itself. If you’re still struggling there’s a couple of places you can ask for support. 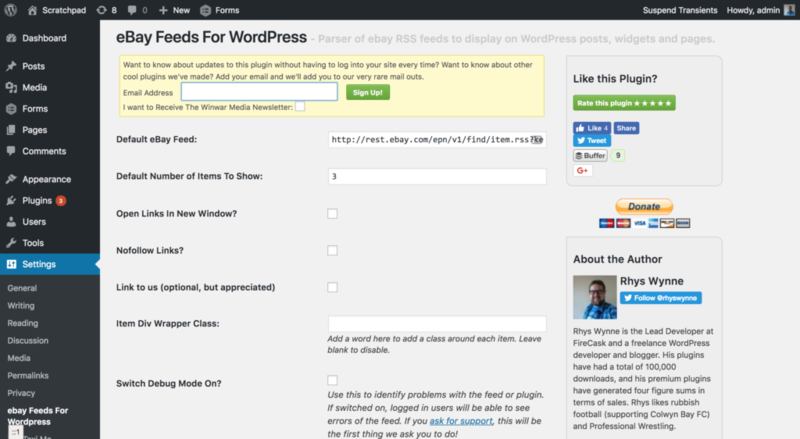 I hope though this will help you set up eBay Feeds for WordPress for your site.